It’s just une petite hop across the channel, but promises a wealth of vintage and antique finds that come with a distinctive sense of romance and timeless appeal. 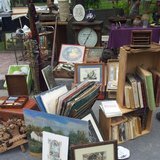 Vintage and antique hunting in France has never been more popular, and increasing numbers of Francophile’s are snapping up pieces with unique Gallic charm at a bargain prix. We say a cheery “Salut!” to two experienced buyers who show us how to navigate the country’s fertile brocantes, flea markets and vide-greniers. She admits that her business is also a great excuse to explore the region’s many countryside brocantes and flea markets, while snapping pictures of her finds and writing about them in her blog. Along with her husband, Cat also creates and hosts vintage shopping tours in Paris and Normandy for vintage lovers and those in the trade. Sounds très facile, so where are the best places to get started? Rachel advises, “A great place to start is http://www.brocabrac.fr which lists all of the markets throughout the year.” But, be warned; it’s in French, Prelovers. With such a feast of riches, which key items does the pair keep their eyes peeled for in the hope of spotting? However, coming across such choice items isn’t always a case of simple luck, and both treasure hunters say there’s no short cut to bagging a bargain, only hard work and dedication. And be prepared to set your alarm clock to the crack of dawn. “You have to arrive early at the sales for the best selection,” says, Cat. 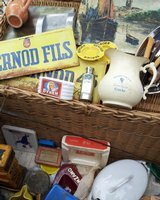 “Professional brocanteurs often come early and can clean out the really desirable items.” Similar, then, to carboot sales in the UK. Language is another barrier that needs to be overcome, so how can buyers seal the deal if their French doesn’t run much beyond “bonjour”? “Do attempt to speak French and be friendly even if you can’t. Always says “bonjour” at the very least, and learn a few key phrases,” advises Cat. 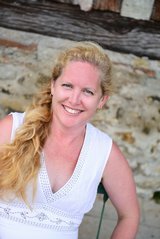 “My top tip is to take pen and paper so that you can easily negotiate with sellers without fluent French, or without making a costly mistake!” Rachel says. 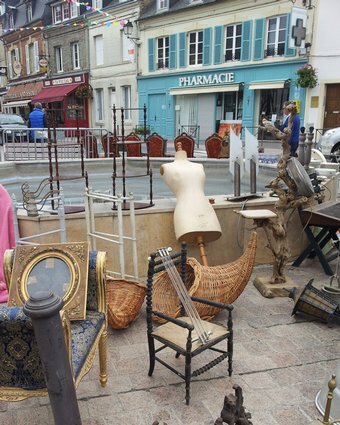 “Shop during the lunch hours (12-2) at the outdoor brocantes and flea markets. Sellers are relaxed, normally enjoying ‘une pique-nique’ and a glass or two of wine… They don’t mind being interrupted if you are a serious buyer and sometimes they are even more likely to give you a deal so they can get back to their ‘déjeuner’. If you want to head over the channel and haggle some great vintage and antique deals, these key phrases could help you seal the deal. How much does it cost? – Quel est le prix? Will you accept…? – Accepterez-vous…? Could you come down a little? – Pourriez-vous descendre un peu? Fancy planning a vintiquing trip to France, check out these websites for the lowdown on where to go. Adele is a creative writer for Preloved. She loves literature, travelling, baked goods and is always hunting for new music. With the average wedding costs in the UK soaring above £30,000, upcycling has become a great way to rebel against this trend and keep costs down while doing your bit for the environment. Choosing to upcycle your wedding doesn’t just help you to have an eco-friendly, budget-conscious wedding, it’s also going to give you so much more freedom when it comes to styling your big day. The great thing about upcycling is that you do not need years of experience, just a little time and creativity. Whether you choose one or two key aspects to upcycle or are going for a more ambitious upcycled wedding project, here are a few of our favourite wedding day upcycling ideas to inspire you.